DURHAM, N.C. – In a continual effort to prepare student-athletes for success once their playing careers end, the Duke Football Future Initiative was held from June 8-10 for members of the Blue Devil gridiron squad. This summer, a continual focus of the football program has been on player development both on and off the field. Jamin Pastore, President & CEO at JP Capital Management (JPCM), paired with the football program to create the Duke Football Future Initiative. Pastore, a native of Lisbon, Ohio, lettered with the Duke football program in 2003 and 2004 as a wide receiver and running back. His JPCM group is a private equity company that specializes in the acquisition and operation of middle market manufacturing, recycling, health care, commodity brokerage and other types of value-added distribution and service companies. The primary focus of the first Duke Football Future Initiative was achieving and maintaining success off the field following graduation. 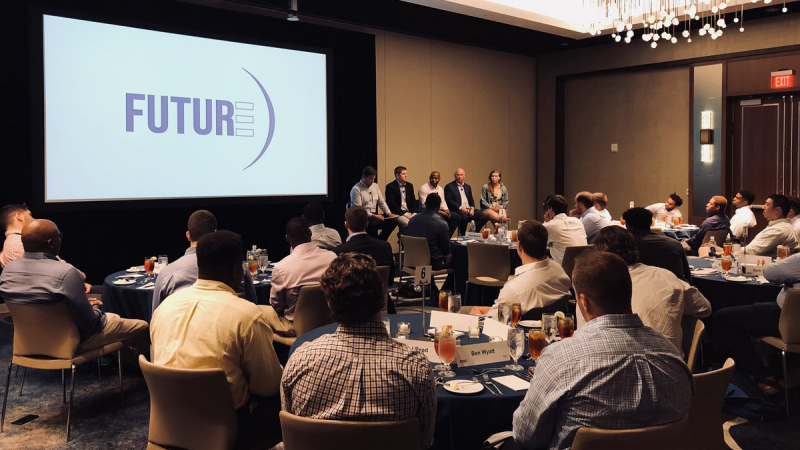 The three-day event, held on campus and around Durham, held a focal point of presenting current Duke football players with valuable career lessons. Highlights from the conference’s first day included two experiential learning sessions delivered by professors from the Fuqua School of Business, a former Duke football player panel discussion where participants openly discussed their experiences and future endeavors beyond the gridiron and, lastly, a networking dinner in hopes of creating lifelong connections for future business opportunities. On day two, the participants were exposed to local companies including Austin Lawrence Partners, McKinney Advertising and American Underground to share information with the players about their industries. Later that evening, another panel discussion took place, this time reviewing on the subject of entering the workforce. A career services session concluded the conference. JP Capital Management is a leading middle-market private equity firm. They provide growth capital to companies ranging from $5 million to $100 Million in revenue, have strong management teams and competitive positions within their respective industries. JP Capital owns and operates a diversified portfolio of companies in Health Care, Real Estate, Recycling, Manufacturing and Commodity Brokerage. JP Capital also specializes in Debt Restructuring and Company Recapitalization. Their decades of experience, integrity, and ability to act quickly, make them a valuable and preferred partner.